The recent works of two friends are on display at the Loft Studios Gallery in downtown Langley. Christine Smith and Wendy Jones are visual artists and friends who are interested in the intuitive process of painting, breaking away from conventional subject matter and technique. Their recent work explores the subject of grief and recovery after the two lost their mothers within the same year. Their works are influenced by the abstract expressionists of the 1950s. To find the gallery, which is also an art school, look for the red painted door at 20458 Fraser Hwy. For more information, call 604-533-3484. The exhibition by Smith and Jones is on until Sept. 28. The Fort Langley Art Studio has taken flight with a new project. Special sculptures created by Kevin Peters and Ron Shore are connected to The Worldâ€™s Greatest Treasure Hunt which is a book written by Shore. Itâ€™s garnered attention because readers can follow the clues and if they figure out the mystery, learn the location of a $1 million prize. The whole project is a way to raise money for breast cancer research through the Hunt for the Cause Foundation. Peters is a B.C. artist with a love of nature and thatâ€™s reflected in his pieces that utilize stone and precious metals. His clients include some A-listers, including the late Robin Williams. Waiting to Soar is a pure, solid silver eagle sculpture adorned with sapphire eyes. It stands approximately 23 centimetres tall with a weight of 5.236 kilograms. It is available for sale at $35,880. Phoenix is a bronze eagle sculpture plated with 24K gold and nickel. The chest and eyes are fitted with cubic zirconia. The price is set at $24,880. A third piece is the subject of a special fundraiser in early 2015. The Maltese Eagle, created by Shore and Peters, will be auctioned for the charity. This is no lightweight. The sculpture weighs in at 18 pounds and features 763 diamonds (a total of 56 carats). The eagle stands atop the Atocha Star Emerald, recovered from a 400-year-old shipwreck. It was discovered by famous shipwreck hunter Mel Fisher. Mel and his wife both died of cancer. Shoreâ€™s sister-in-law died of breast cancer two days after giving birth. â€œThe project combined my biggest passions, treasure hunting and raising awareness and funds for breast cancer research. I mortgaged my house, used my savings, borrowed money and sought sponsors to fund and assist in the massive financial investment required for the books, other prizes, the website, and the biggest cost â€“ the treasure,â€ Shore said on his website. Then he set about creating the sculptures as part of the treasure hunt adventure. 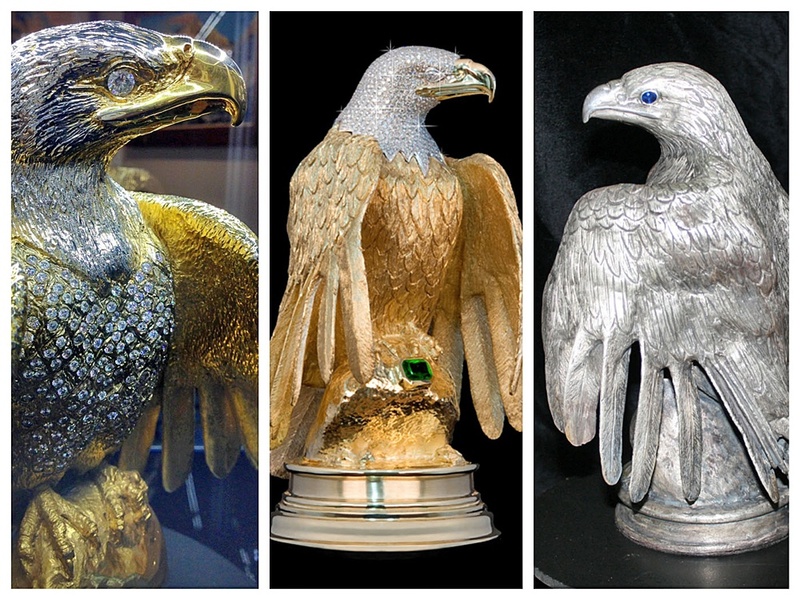 It took more than 4,000 hours to create the Maltese Eagle. Currently valued at $6 million, it is for sale through the Fort Langley Studio at $5 million. Upon purchase $1 million will be donated to Hunt for the Cause to help cure breast cancer.